Moss may not have smashed onto the scene, loudly changing the video game industry, but it quietly advanced a number of common pieces that we often take for granted in games. The combination of these pieces became an incredible experience that led to a real emotional connection with a virtual life form. We previously talked to both composer Jason Graves on how his music helped accomplish that feeling, and Lead Audio Designer Stephen Hodde about crafting the soundscape for Moss’s immersive world. But Moss is a sum of its parts, and we wanted to talk with more of the team about their contributions to the whole. Moss’s lead character, Quill, is of particular interest. She’s the centerpiece to players, and from the moment anyone first saw the tiny mouse on screen during the reveal trailer at E3 2017, they fell in love with her. She dusts herself off, shields her eyes from the sun, then looks towards the screen and notices the viewer with a couple of tiny and almost imperceptible head twitches. We wanted to talk to Moss Animation Director Rick Lico about bringing Quill to life in a way that most video game characters are not. Lico, like Hodde, originally came from Bungie. 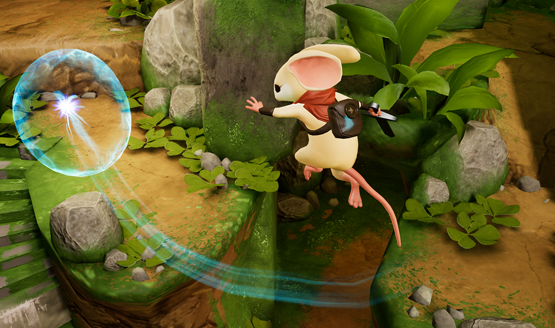 He did extensive animation work on Destiny before landing at Polyarc and bringing this lovable mouse to life. Building a relationship is easier with a sense of presence, and VR by its very nature already does that, which made it the obvious choice for Polyarc to bring Quill to life in. In terms of connecting with players, Lico says it’s actually easier in VR because the presence is already built into the hardware. He doesn’t need to worry about solving problems and breaking out beyond the TV screen, and can instead focus on the other technical challenges VR might bring. Lico’s spent a lot of time talking about animating Quill. Her charming subtleties are the highlight of the game, and I didn’t want to dive into specifics that he’s covered a million times before. In fact, if you want to read some great points about the specifics of certain animation moments and interactions, Lico had a great post on the PlayStation Blog about her gestures and sign language, along with gifs that sample many of them. What I wanted to explore was the unique dynamic between Quill and the player. 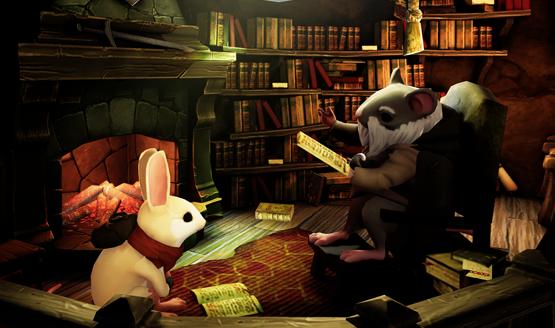 The player has a role within the world of Moss as “The Reader.” Unlike many other games where the player becomes the main character, you aren’t actually taking on the role of Quill, though you do still maintain direct control over her. It was important to balance the perception so that the player never felt like they were playing as Quill, but rather being a guiding hand through her journey. “Even though you’re the one pressing the button[…], I try and make it look, as much as I can, like she’s the one performing the action and you’re guiding her.” Lico also explained that they didn’t want the guiding hand to be a detriment to gameplay, so they made controlling Quill a direct influence. They then balanced that influence through her animations to make everything she was doing feel intentional, like she was the one consciously performing each action. Intention is communicated through the nuance of her movements, like the way she rolls up onto ledges in a way that is uniquely Quill. While Quill’s assistance served a gameplay purpose, it also gave her more life. “If she has an opinion about what you’re doing, then that means she’s thinking. So once the player thinks that she’s thinking they believe she’s real, they start forming a bond with her,” Lico said, continuing to reiterate that it made her more of a friend and a partner with her own thoughts, opinions, and desires. She has an intelligence, and she’s going to use that intelligence to assist the player who is also assisting her. Anthropomorphic animals are nothing new, but as Lico has already said, he wanted to avoid some of that caricature you can get when exaggerating features. 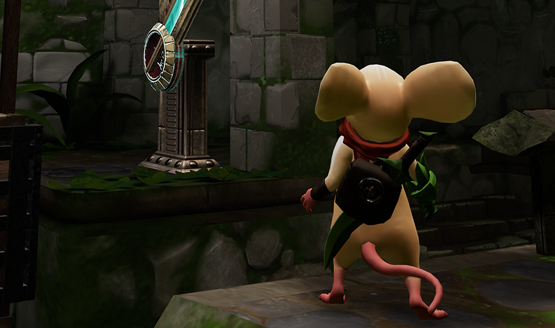 In order to connect with players, Quill had to show a human intelligence and the emotional ability to connect back. She couldn’t simply be a mouse, yet her animal form is part of her charm. I asked Lico if that balance came from a lot of iteration or if they landed on exactly who Quill was early on. His response hinted a little bit at the wider lore of Moss beyond this first game. We’ve all seen the cute Quill animations as she waves back to the player or gives high-fives when you accomplish tasks together, but Lico talked a little bit about animations that haven’t been widely discovered yet. By being over-friendly and petting Quill for too long, she gets annoyed at the player. If you continue waving at her a lot, she’ll eventually gesture that you need to calm it down. If you fail to give her a high-five, she gets frustrated and high-fives herself as if to say “I’m not going to let you stop me from celebrating this achievement!” By not responding exactly as the player might expect, it gives her a unique personality that sets her far apart from just another traditional avatar being controlled by the player. One of the scenes that resonated most for me early in Moss is arriving in the mouse village full of characters and life. In my talk with Stephen Hodde about audio design in the early moments of the game, we discussed it feeling very much like The Lord of the Rings’ The Shire. The living village, really only present in one single scene, helped to sell the idea of Quill’s transition from peaceful innocence to perilous adventure. 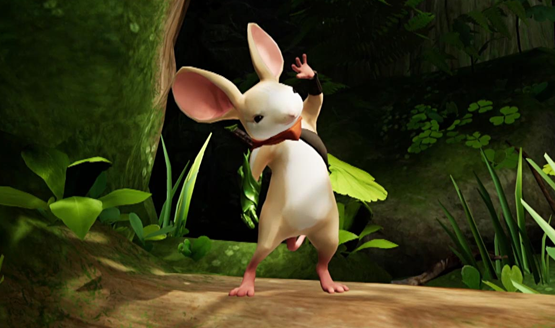 Art Director Chris Alderson felt very strongly about having the other mouse characters in the town, but it was an element that almost didn’t make the final cut before Polyarc shipped the game. When Quill pulls out her sword near a guard and the guard gives her the “tsk-tsk” finger, Lico revealed that’s actually the same animation as Quill’s when you sneak up behind her. He simply chopped off the ending of that animation and used it for the guard. While there was a desire to get bring this added life to the game, a fifteen person team attempting to get the game done made him explore creative solutions for problems like this, or risk cutting the feature altogether. Finally getting into Sarfog, the snake that haunts Quill’s journey and ultimately becomes the antagonist of the story, Lico admits “He was one of the most difficult characters I have ever worked on.” Sarfog’s movements are all very intentional and are often part of the level design, and Lico says that animating what is essentially a giant rope to be intentional is not easy to do. They couldn’t use physics to make the process easier, so everything was done by hand. Because of his weaving throughout the set pieces, the level team couldn’t adjust any geometry when polishing up each scene, because it would interfere with Sarfog’s animations. Not only was Polyarc a new studio, but they were working on a new platform. Saying it out loud, the idea almost seems crazy. This small team of industry veterans got together to do the insane, and it paid off in an experience that perceptibly moves the medium of video games forward. Moss is a point of pride for the studio, but they aren’t resting on their laurels with their accomplishments. Lico talked a little bit about boding with his favorite character that he’s ever worked on and how he would like to expand her ability to connect with players in unique ways. Moss is just the tip of the iceberg. “Virtual actors.” That’s where Lico thinks the future of video game animation is headed. “I couldn’t imagine 20 years from now still setting ‘translate X on the foot. '” Lico’s vision of the near future is a natural next step where traditional animators as we know them are obsolete. They will no longer be crafting animations from scratch, but acting as a director for these virtual actors that have learned how to animate and move on their own. They might make subtle adjustments the same way that a director might tell an actor to do the next take a little differently, but animators will no longer be crafting walking animations from scratch by hand. “As animators, we’ve got a short term career ahead of us, because I think what you’re going to start seeing over the next 5, 10, 15 years is the advent of learning systems and characters that can learn how to walk and can learn how to gesture. And then what does an animator do at that point? In that world and animator isn’t going to worry about the arc of the hand anymore.” Lico believes that partnering with learning systems and animation automation will, over time, provide realistic and natural characters that no longer need to be animated by hand. Not only will it change the production flow of how games are animated, it will also allow those animations to feel more organic and natural, as opposed to manufactured. Quill is one of those virtual actors, and it’s through her animations that players are able to bond with the character. “I think [Quill] was a good prototype for that. Yeah, I think she’s starting to go in the direction of that virtual actor, that more natural, meaningful connection that you get,” Lico said. The work that was done on Moss continues to set the stage for this future. It gave Lico and the team at Polyarc additional insight into how to make a character that is not simply animated by plotting points on a graph, but one that actually feel natural to interact and connect with. 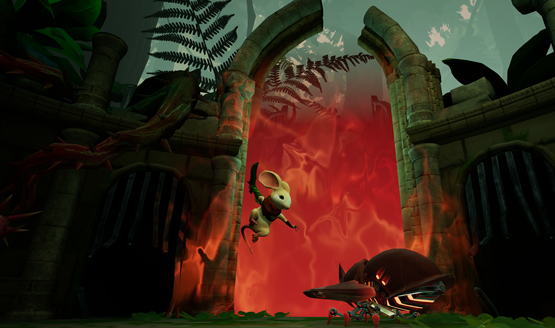 The nature of connecting with Quill in VR means we’re unlikely to see her get a flatscreen release, at least not in the same way. That’s not to say it will never happen, but Polyarc is pretty focused on VR right now, even as they’ve brainstormed a ton of ideas on Quill’s future. There is one way you can get Quill outside of the headset right now, and that’s with the animated Moss iOS stickers (I’m still waiting for these to make their way to Google devices, Polyarc! Pixel 2 support please!). 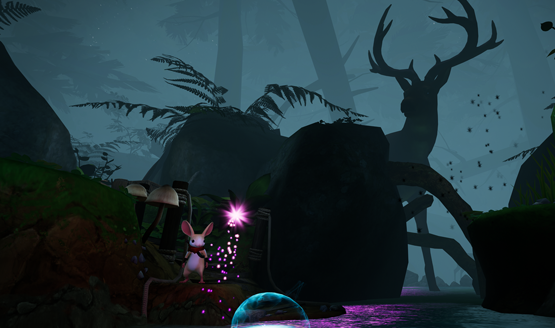 Moss doesn’t just take brave new steps forward for the VR space, but provides plenty of tools and templates that even traditional flatscreen games can employ in the future. Moss quietly evolved elements that we thought we knew, making players rethink how they interact with characters in their game. When I play Uncharted, I feel connected to Nathan Drake on a character level. I am invested in his story. 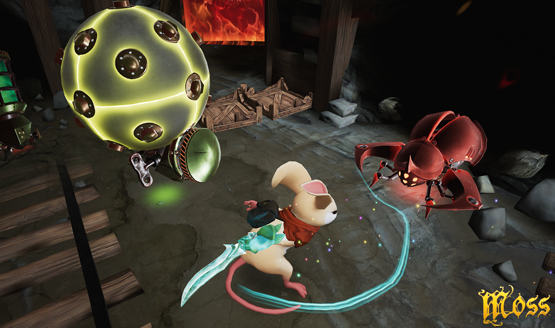 But when I play Moss, I feel connected to Quill as a friend. Polyarc have redefined “breaking the fourth wall” by allowing players step through it themselves, rather than having the characters break out. Quill isn’t aware of our world, but we are keenly aware that we have stepped into hers. Talking with Rick Lico, I could feel his passion for breathing more than just life into Quill and the world of Moss. He wanted to bring intent and history to every small movement. He wanted to make sure that characters felt intelligent and not manufactured. He wanted to allow a player’s bond to be reciprocated by the character in a way that games have never done before. While he accomplished all of that, he and the rest of Polyarc are already hard at work taking what they learned and evolving the way that we as gamers will interact with our games in the future. I can’t wait to see what they bring to the table. If Moss is just the tip of the iceberg, then it’s time to sink the Titanic of traditional gaming ideas with what waits below the surface. We’d like to thank Rick Lico for taking time away from working on his future projects to talk with us.